Hi guys, I recently got myself an Oculus Rift due to some insane luck and have been peering around all kinds of other VR-suited devices in the works. The Omni looks incredible so far and I'm so excited for it, mainly because I can finally exercise while I game. My main query though was to do with the waist size. I notice that the small, medium and large sizes are for 24-30, 31-37 and 38-44. As someone currently at a 36-38 depending on where I buy my clothes from, and the fact that using an Omni would almost certainly give me a work out, I'd be a bit concerned with buying a large only to eventually drop a size too far and need a medium one instead. What are your plans for that? Would there be alternate sizes that work between the current three, or are those three ranges the only ones you plan on eventually producing? Hi @TallestGargoyle, welcome to the forum! Only those three sizes announced for the time being. I would recommend the medium size in your case. The belt is not like other items of clothing where, if too tight it can feel uncomfortable. Whichever belt you get you'll want to adjust it so it fits snugly, as that works best. You're certain to lose weight by using the Omni so I'd pick a belt where you're at the upper end of its range, not the lower end. Hope that helps. I am also having some trouble deciding, seems by measuring my current pair of jeans I appear to be a 32" waist (my jeans are 16" in width on one side), however in some jean stores I buy jeans marked with a 30 waist, when I measure my own waist I get about 32". in my case what would you recommend, should I be at the lower end of the medium scale, or possibly at the very highest end of the smaller harness. If you're in-between, I recommend going for the smaller harness. The belt should be tight around your waist anyway, and you're probably going to lose weight. I'm a 34" waist and think I used the medium one. The Velcro had lots of overlap. The thigh-straps want to be a bit looser - snug at most, and I don't imagine they vary much between the harnesses - they're easily adjustable. Either one would probably work for you. I guess it's always better to have it slightly too big than slightly too small. And, this way, it will probably fit most of your friends too. Good point @Jorgen! The medium size will fit most people I think. hmm now I'm quite confused on what to get, but if I have it slightly too big does that mean I wont be strapped in tight enough? and what issues could arise out of that? and for the opposite, if I order too small and I don't fit in that well, will it just be overly tight in which case it would not be useable at all? I am a 5' 4.5" 164cm male btw, that is my exact barefoot height, omni size 7 is my shoe size. not sure if that illustrates my waist size, but it may help in some way. If it's too big I imagine you'll have a bit of spare waist-strap that doesn't Velcro down. The back should still conform around you and be tight, but can't say for sure. I have used different sized harnesses before and they both adjusted to fit me. If it's loose you may find yourself leaning forward too much. A smaller harness wouldn't necessarily be too tight, you might just have less strap to Velcro down, but it shouldn't come undone. So I'm sitting around 32" (5'4" at 160 lbs currently) and I expect to lose about 15-20 pounds, should I want to get a small harness or...? At what point would you say a small is TOO small in your experience with the different harnesses? 32'? 33"? 34"? I would normally just default to a medium, but if I can manage a small and have no issues, especially with the extra weight loss, I'd rather not have to buy another harness down the line. Also, my girlfriend would probably fit a lot better in a small harness. Thanks for your help, sutekiB. I normally wear the medium, but I have used the small before, and it was fine (I'm 34" waist). That wasn't the new harness but I expect the same still applies. If you're 34" waist and under you can probably use the small and share it with your girlfriend, and it's useful for kids too. That's my opinion but I wonder if @admin agrees? @sutekiB interesting that you have tried small yet you were fine at 34", well I will likely never exceed 32" and with the help of the omni would only go down in size as I could do with losing about 2 stone to my frame to be my ideal weight, so a small would be the one for me given the information you have supplied. Hmm, just realized I actually tailor my jeans to sit on my hip, so its more likely 32" would be the smallest my waist size would ever be once I am skinny, from my actual waist I am more like 34", but if I don't breathe in my tummy it would be 35", hard to judge. So does the harness actually wrap around your waistline, I.e. around your belly button? @OculusRiftRocks Yes it wraps around. 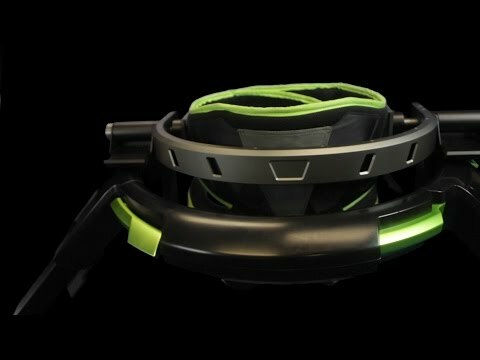 You can see in the video (about 13 seconds in), the padding goes around and overlaps, and then you tighten it by passing the Velcro strap through a buckle and sticking it down. is the only difference between medium and small how much waist strap there is, nothing on the actual plastic? machine itself, and if so could you turn a medium harness into a small harness by having a different waist strap? I think the frame that attaches to the harness is the same for all of them, since they all rest on the same ring, but the harness itself (the material that goes around your back, and your seat) may be different sizes, not just the waist strap. A bit like a kite-surfing harness. I'm not 100% sure. @Dev_Guy_Robert, do you know? Okay I've heard back and from the sounds of it the small harness will be tailored to fit the smallest of users snugly, so if you measure yourself to be in the medium range, it is better to stick to medium. Hope that clears things up! okay thanks, given that my hip measurements are 32" I i will order the medium one then which is stated to suit 31"-37" waist. I'm sure for a male it is not very possible for your waist to become smaller than your hip!